George “Jack” Edwards of Shiloh, an African-American boater, used to rent a slip at the city-owned facility but now keeps his boat at Grafton Harbor. Edwards said he was on one of his friends’ boats at Alton Marina during the July 4 holiday weekend when he saw the Confederate flags. He said he has two black friends with boats at Alton Marina who also are offended by the flags. The Telegraph called one of the men, who was unable to discuss the matter at the time, but said he agrees with Edwards. To clarify, the flags are not flying on city property, but on privately owned vessels docked on federally regulated waters in the marina that Alton owns. When a boat owner leases a slip, he or she must comply with 38 rules and conditions, including having certain levels of liability insurance; responsibility for damage their boats or equipment cause; keeping the boats in good condition, “in a clean and aesthetically pleasing manner;” no selling or advertising boats or other commercial activity without management’s permission; no painting or installing materials on docks; no transfer of lease with sale of vessel; no swimming, fishing or cleaning fish in the marina; designated quiet hours; no open flames; no roller-blading, skateboarding, bicycling or motorcycling on docks, among others. None of the rules apply to decorations, signs or flags on the vessels. 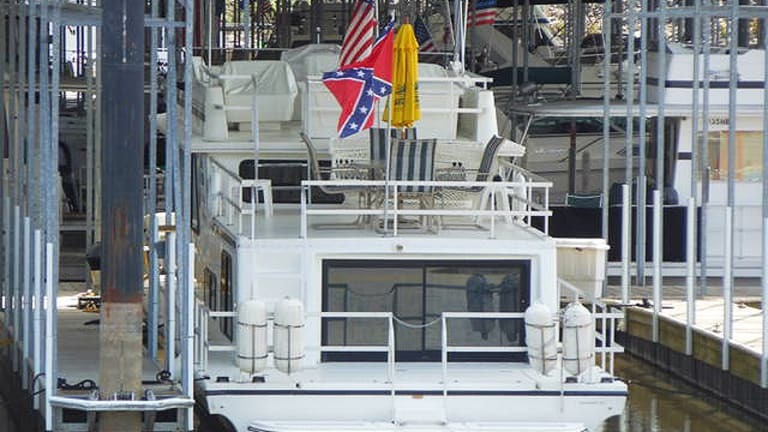 This week, one of the Confederate flags was posted along with two other flags — one a U.S. flag — on a large houseboat. The boat reportedly is decorated in a theme based around one of the owners’ name that is related to the South. It is docked on the southern edge of “I” dock by the channel where vessels travel to the adjacent, transient dock and other docks to the west. The flag is visible from a distance from the main Marina parking lot open to the public. The second boat flying a Confederate flag is docked by the swimming pool, east of the office-snack bar-shop and laundry complex. That boat’s flag was easy to see this week from the smaller parking lot northeast of the large lot. That lot is near the fuel station, fenced trailer storage lot and closer to the public boat launch and Clark Bridge. The Telegraph could not get access to the docks to see if the owners were present at the boats to ask about the flags. The marina is open only to slipholders, their guests, staff and other authorized visitors. Walker said he understands how some people might think the flags give a negative or unwelcoming image of the city. He declined to say if officials plan to talk to the boat owners to see if they might consider removing the flags. As of mid-week, no official had discussed the flags with the boat owners. Edwards said he called Walker and marina manager Karen Baker-Brncic, owner of Parrot Pointe Marine Inc., who he said told him they could do nothing about the flags. Baker-Brncic referred a reporter to Alton Corporation Counselor Jim Schrempf, with whom she discussed the matter on Monday. 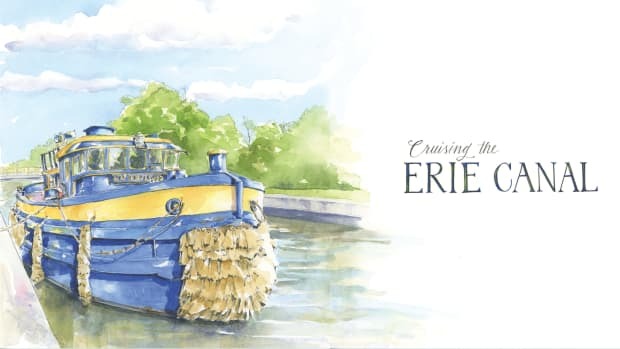 “The City of Alton is the owner of the Alton Marina on the Mississippi River. Parrot Pointe Marine Inc. manages the marina under a contract with the City of Alton. You are the owner and chief executive of Parrot Pointe Marine Inc.
“The primary business of the marina is the leasing of boat slips or docks. 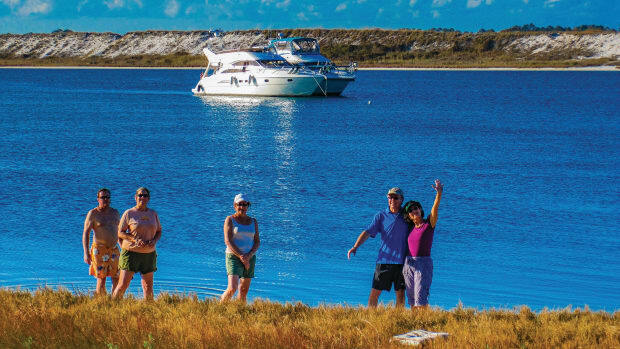 When a private boat owner enters into an agreement with Parrot Pointe Marine Inc., they have a right to dock their boat in a given boat slip at the marina. 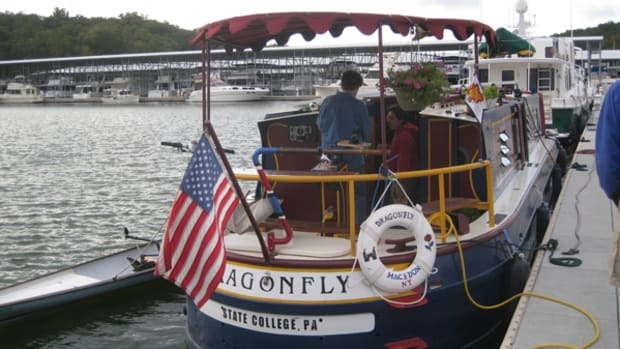 In the leasing of boat slips, you and I have discussed in the past the need to offer those slips in a non-discriminatory manner, refusing to lease to individuals only (on) the basis of their past experiences as a boat owner at the City of Alton marina or perhaps as a boat owner at other marinas. 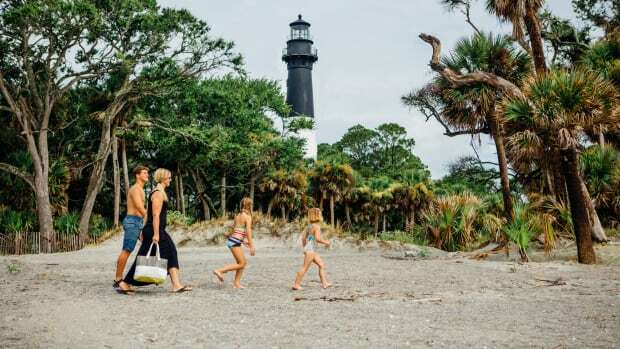 “Apparently you have at least two boaters who are displaying Confederate flags either painted on their boats or an actual flag flying on their boat(s),” Schrempf’s letter continues. “You have advised that some citizens have approached you complaining that the Confederate flag is a symbol of racism in America. Clearly for many people, the Confederate flag is a symbol of racism. To others, the Confederate flag is a symbol of a heritage in America of which they remain proud. As to those who consider a Confederate flag to be a symbol of racism, they are understandably offended by the display of the Confederate flag. “Those who are offended by the Confederate flag have made demands upon you to prohibit the display of the Confederate flag anywhere within the Alton Marina,” the letter continues. “I do not believe you are legally allowed to prohibit such signage in the space leased to private individuals for the storage of their boats. It would be a totally different question if, for some reason, you or some of your employees had displayed a Confederate flag on the property within control of Parrot Pointe Marine or the City of Alton. This is not the case. 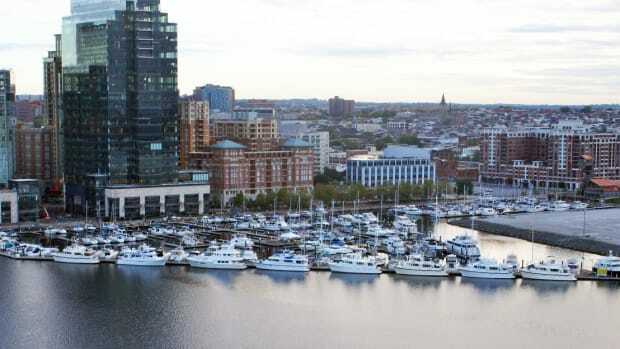 “The nature of the marina is that you lease the space for the storage of a privately owned boat,” his letter continues. “You are not legally allowed to prohibit signage on privately owned boats based on the content or the message of the sign. The display of a flag is a form of signage. The content of a sign represents a form of speech. The Constitutional prohibition against a municipality or its agents regulating free speech would, in my opinion, prevent you or the City of Alton from a rule prohibiting the display of a Confederate flag by a private boat owner on his boat in the lease space he controls at the Alton Marina. This would also include ingress and egress through the marina to that space. “In my opinion, as manager of the marina, you should offer by way of explanation only the legal conclusion that the City of Alton is not in a position to regulate the free expression of ideas by way of regulating signage on a boat such as is being experienced in this instance involving a Confederate flag,” Schrempf’s letter concludes.